"Let's get one thing straight: don't mistake me for your usual collector who fills his gallery with sundry items picked for age, trade value, and intrinsic beauty. Most such folk have no trouble showing off their treasures. That's not me. "I only collect things of deep personal means to me, things that have 'lived', actors in histories I alone know, from research. Once I obtain them, I set them aside, no one else ever sees them again." Originally published in 1984, at long last this masterpiece has been translated into English. I believe this is pretty much the only original longer form work that Toppi did, instead preferring to concentrate on various one-shots. I have no idea why that would be, perhaps just the circumstances and fashions of the Italian and French comics scene at the times, but to our modern tastes, seasoned as they in favour of the extended narrative, I can't help but think that is a crying shame. Because as truly wondrous as Toppi's line-led art style is, here the writing is equally as well crafted. He clearly was able to spin a tale just as well as he could illustrate it, because in the Collector he has created a truly fascinating character. Yes, the Collector is a man who always gets what he wants, whether it be an enchanted Native American peace pipe, or a necklace imbued with magical powers once owned by the great Lama Padmasambhava. But when an object of his desire is acquired, it will never be seen again by another living soul, for the Collector's treasures are for his avaricious pleasures alone. For the most past he is a man of absolute honour, but he's not above a moment of crafty chicanery, devious double-dealing, or even outright treachery to gain his prize. And for those who cross him, or worst still also lust after what he covets, well, he's a fearsome enemy to have to face. There's a superb foreword from Sean PUNK ROCK JESUS / JOE THE BARBARIAN Murphy which absolutely nails the appeal of Toppi's unique style, and for me underscores everything that is beautiful about our preferred medium of choice. There is no wrong or right way to illustrate a comic, as Sean states, "Here's the first lesson of Toppi: you don't even need pretty lines to create pretty artwork - even the most basic, entry level type of scribble can be turned into a masterpiece if you apply it correctly." 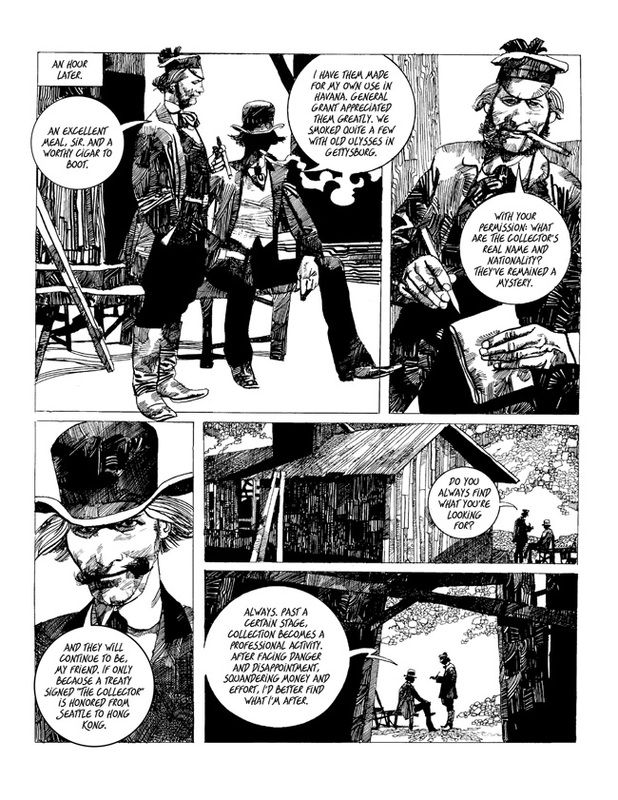 Toppi found a unique methodology of drawing that allowed him to express his own inner vision to its fullest. But beyond that, he also had an incredible understanding of how to make his artwork stand out from the page. Look closely at this work and what you'll immediately notice is whilst there is immense foreground detail poured into the characters, there are equally vast expanses of white background, ensuring the focus stays firmly on the principals of the scene. 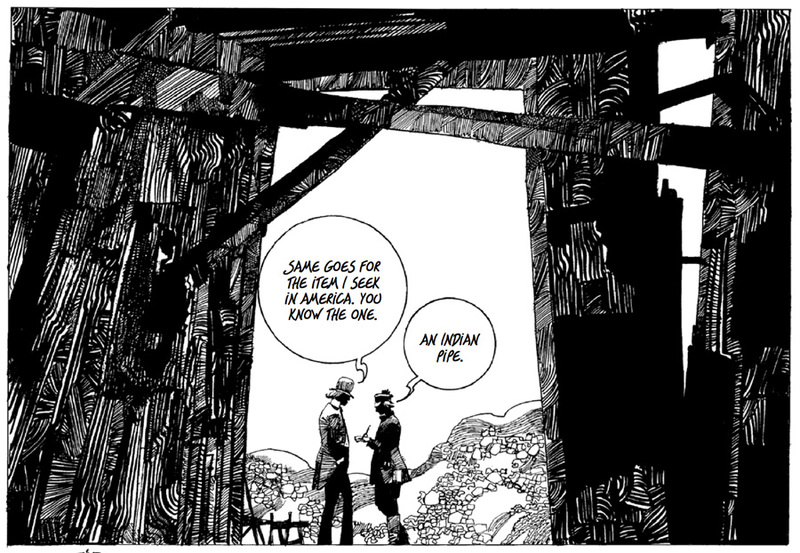 He was very figure-focused, Toppi, but even on the occasions where there are vast open vistas, the insanely detailed landscape itself is contrasted against a blank white sky. Contrast is the key word here, and it's a tool in all its forms that many artists don't understand how to use properly, or haven't mastered, at least not to this degree. Not all artists have styles that demand it as much as Toppi's, to be fair, but where you have a style as rich in textural complexity as this, it's essential for the balance of the panel composition. 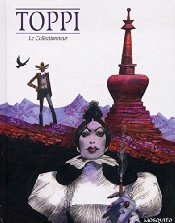 At the start of this work there are listed about 20 or so other works by Toppi, as yet untranslated. I fervently hope that Archaia will continue to publish English language versions of this material, because it so deserves the widest audience possible. A true great.